Two synthesis routes were used to design high surface area niobium-doped tin dioxide (Nb-doped SnO2, NTO) nanostructures with either loose-tube (fibre-in-tube) morphology using electrospinning or aerogel morphology using a sol-gel process. A higher specific surface area but a lower apparent electrical conductivity was obtained on the NTO aerogel compared to the loose tubes. The NTO aerogels and loose tubes and two reference materials (undoped SnO2 aerogel and Vulcan XC72) were platinized with a single colloidal suspension and tested as oxygen reduction reaction (ORR) electrocatalysts for proton-exchange membrane fuel cell (PEMFC) applications. The specific surface area of the supports strongly influenced the mass fraction of deposited Pt nanoparticles (NPs) and their degree of agglomeration. The apparent electrical conductivity of the supports determined the electrochemically active surface area (ECSA) and the catalytic activity of the Pt NPs for the ORR. 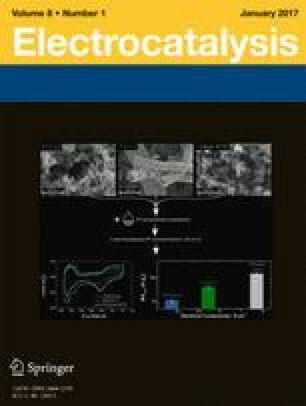 Based on these findings, electrospinning appears to be the preferred route to synthesize NTO supports for PEMFC cathode application. The online version of this article (doi: 10.1007/s12678-016-0340-z) contains supplementary material, which is available to authorized users. The authors gratefully acknowledge Pierre Ilbizian for supercritical drying and Suzanne Jacomet for SEM observations of the TO and NTO aerogels. The authors acknowledge financial support from the French National Research Agency through the SURICAT project (grant number ANR-12-PRGE-007) and the European Union’s Seventh Framework Program for the Fuel Cells and Hydrogen Joint Technology Initiative under grant agreement No. 325239 (FCH-JU project Nano-CAT) as well as Capenergies and Tenerrdis. MC thanks the French IUF for its support. SC acknowledges the European Research Council under the European Union’s Seventh Framework Programme (FP/2007 − 2013)/ERC Grant Agreement No. 306682. The authors declare that they have no conflict of interest (financial or non-financial).